When I first started camping the idea of living in a tent was compelling. Detached from the world back home, for weeks on end, I traveled through the wilderness in reasonable comfort. Over the years I had tents in different sizes and designed for various conditions. Some for backpacking, or canoe camping; engineered to sustain high winds, extreme cold, or heavy rains. 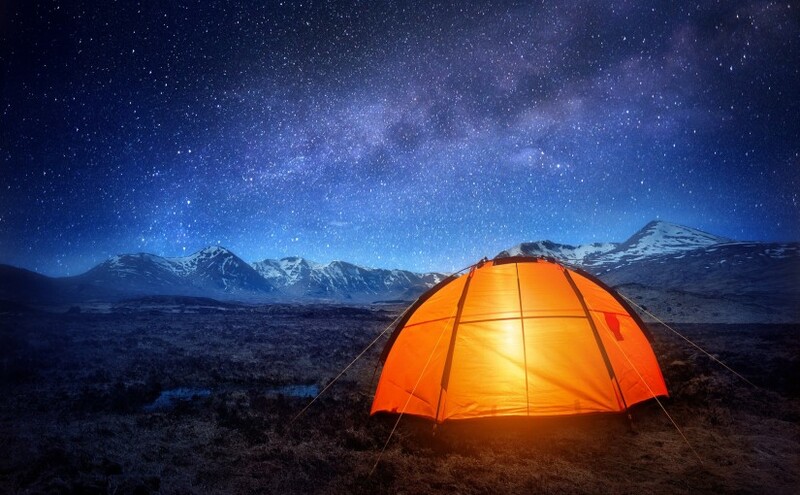 I cherished my tents, for without them, traveling into the wild would have been difficult. In 2 Corinthians 5, our bodies are compared to tents, and like tents, they lack durability. Our earthly bodies are temporary, so inadequate that we groan for something better. The heavenly body we long for will allow us to be in the presence of almighty God, but the body we have now allows God’s Holy Spirit to dwell within — if we choose. Earthly needs, like food, clothing and shelter are used in the Bible as simple metaphors, which are reflections of more durable, holy things; helping us to understand their better eternal counterparts. Certainly it is a different life that awaits our arrival in the Celestial City, while our present lives offer glimpses of what awaits us in the better one. I believe my eternal citizenship is in God’s kingdom — a place I can choose to dwell today. Tents provide the simplest and most portable housing. If we are nomadic wanders, the tent is perfect. But it isn’t until we build up permanent settlements of towns and cities, that we form more advanced civilizations. Ironically, Jesus speaks of, and demonstrates, the simple life of a nomad, while Paul contrasts tents to more desirable, permanent structures. I think this shows that our desire to build something better is often misplaced when we seek to build too much with the things of this life for ourselves. Our earthly bodies are magnificently designed to serve the present needs of this life, while at the same time, housing our souls, which are destined for eternity. But earthly bodies are something much less than what we would expect of those designed for eternity. Our present bodies are referred to as jars of clay, for they are fragile; but they are also referred to as temples — sacred structures meant to receive God’s Holy Spirit. And by this we are transformed! In this present life we have the opportunity to build earthly kingdoms that fade away. Some fade faster than others, but most, in a sense, are gone in an instant. Alternatively, we can live life by investing in the treasures that await us in the next. Now in a way this may sound foolish; betting by faith on a the existence of an eternal kingdom, and against the ones we might build here and now. In extraordinary circumstances, people build dynasties that last, perhaps, hundreds of years. What God offers mankind, through Jesus Christ, is a spiritual legacy that lasts forever — and an eternal home. If this offer is true, it represents incredible value. I believe the proof of this is the simaltainious offer of a better life on earth, a life filled with lasting peace and joy in all circumstances. A life of transcendence, directing our energy away from us and to the benefit of others. This even seems to line up with other belief systems; but what they don’t offer is the indwelling, transforming, life giving, power of the Holy Spirit of the living God — the comforter promised to us by Jesus. In this life, within our tents, we are given the opportunity to experience hope, peace, joy, love, and wisdom through fellowship with the one true God. And in our struggles, when we turn to God, we grow. If we follow God into an eternal kingdom, in our surrender, we become a new creation. This is when we begin to see and experience the world in a whole new way. Dear God, your power is supreme and your love is fathomless. Thank you for your wisdom and your Grace. Please help me to know you better each and every day, for the rest of my life eternally. Amen.